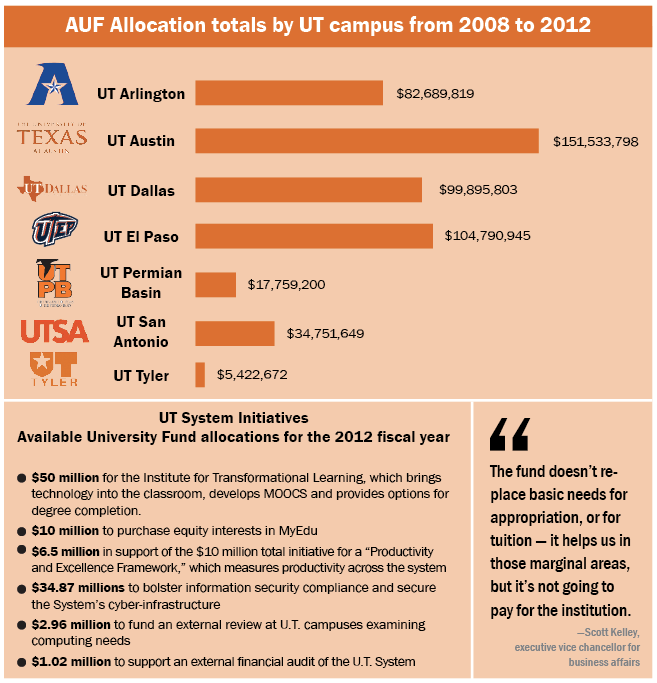 UT System endowment assets hit a new high at the halfway point of the current fiscal year with a combined worth of $21.7 billion on Feb. 28, according to documents from the University of Texas Investment Management Company’s most recent meeting. The Permanent University Fund, a public endowment made up of 2.1 million acres of land located in West Texas, earned 8.4 percent in investment returns in the latest 12-month period ending in February. Meanwhile the General Endowment Fund, largely made up of donations from alumni and others, earned 8.5 percent in investment returns over the same period, according to UTIMCO CEO Bruce Zimmerman. UTIMCO is the nonprofit corporation that oversees the UT and Texas A&M systems’ investments. Zimmerman said he hopes investment returns on the endowment continue to increase, but stressed the importance of taking a long-term view when gauging the returns’ success. According to figures Zimmerman provided, the various funds managed by UTIMCO have grown overall in the last 10 years. For the 10-year period ending Feb. 28, the Permanent University Fund’s returns hovered at an average of 9.1 percent growth annually, while the General Endowment Fund had an annual average return of 9.2 percent over the same decade.